Lough Erne Resort's hosting of the 2017 Irish Open appears to be in some doubt. In April 2014, it was announced that the 2017 event would be held at the Fermanagh venue. There has been speculation the event might be moved to another venue and the European Tour said on Thursday there was "no definitive decision". 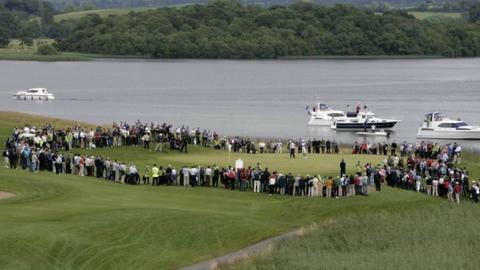 However, in response the Lough Erne Resort stated on Friday that it is "very much looking forward to hosting the Irish Open". It added: "The owners and management of Lough Erne Resort have been in frequent contact with the European Tour regarding this event and have received no notification of another venue hosting the 2017 Irish Open. "We are continually working in conjunction with the relevant agencies and with the full support of the First Minister in this regard and we have everything in place to deliver a world-class tournament for this part of Northern Ireland and the island as a whole." It follows European Tour official Antonia Beggs saying that "there are a lot of discussions going on behind the scenes and I can't confirm either way". The announcement in 2014 of Lough Erne's hosting of the 2017 European Tour event in came on the same day that it was revealed that Royal County Down would host the 2015 tournament. However, since then new sponsors Dubai Duty Free and Rory McIlroy's Foundation have come on board while the European Tour has a new chief executive with Keith Pelley taking over after long-serving George O'Grady's retirement. Ms Beggs added:"Keith has some really definite ideas about strategy for the European Tour as a whole. "I'm not going to speak on his behalf but he has big, big ideas about what he wants to do and the Irish Open is a key part of that strategy." If the tournament is moved from the Nick Faldo-designed Lough Erne course, another Northern Ireland course Portstewart could be the new venue. BBC Sport Northern Ireland has learned that European Tour officials have already visited Portstewart to check about its suitability to stage the Irish Open at some date in the future. The Lough Erne Resort hosted the G8 summit of world leaders in June 2013. Meanwhile, Irish Open organisers are hoping that Tiger Woods and other US stars might play in this year's event at the K Club. All members of the 2006 European and US Ryder Cup teams that played in the biennial match at the K Club are to receive invitations to this year's Irish Open, which takes place on 19-22 May. Tournament host McIlroy was able to convince big names Rickie Fowler, Sergio Garcia, Martin Kaymer and Ernie Els to play in last year's event at Royal County Down. The European Tour may be hoping that McIlroy may be able to use his influence to attract more world stars to this year's event. Fourteen-time major winner Woods is currently out of action following two back operations last autumn and there has been no indication when he will return to tournament action.